So, for campers, a camping towel is a must-have item. Don’t panic; those towels doesn’t cost much. The price is almost similar to a regular one. Plus, you will be able to use a camping towel as a regular towel too. 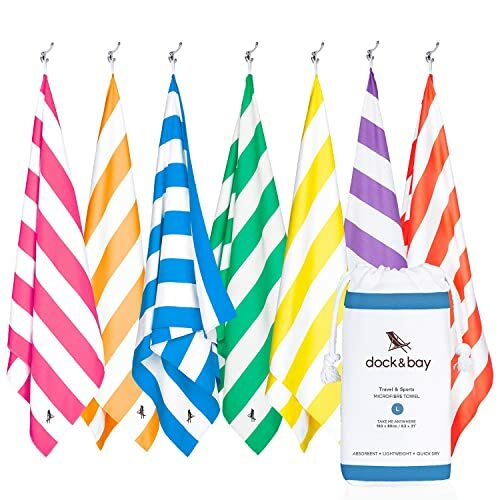 When it comes to travel or camping towels, finding a good one is a tough job! Why? Because most of the people think that Towel is Towel! So, if you go to the market for a travel towel, you might end up with a regular one. To save you from this hassle we completed the market research part and enlisted ten best camping towel of the present time. In here, I will discuss those towels with complete honesty. I will tell you the drawbacks of each product as well. After the end of the article, you will be able to find the best one according to your need, that’s a promise. 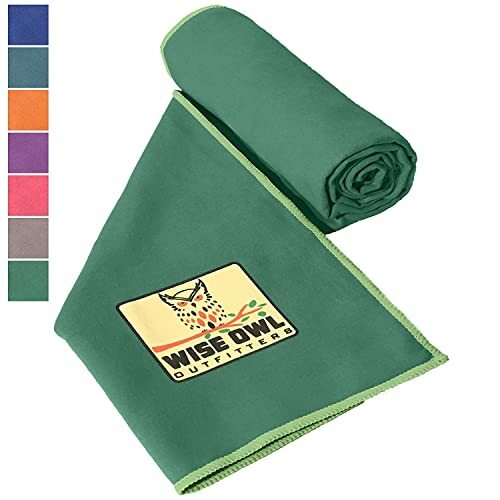 Wise Owl Outfitters Camping Towel gets the first position in our list due to few reasons. For sure, it is better than any other towels on the market right now. The size is great. The XL towel is about 5×2.5 ft plus and the large one is about 4×2 ft. However, those packs down very smaller that’s why it is the ideal choice for outdoor enthusiasts. The towel is made of premium quality microfiber material. So, it is soft and super absorbent. It will soak up almost anything. Besides, it is also praised for faster drying ability. The towel is multipurpose and ideal for various uses. You can use it in fitness activities, hiking, boating, camping, swimming, in the gym or anywhere you wish to. The item is lightweight as well. Overall, it is a good buy in a reasonable price range. 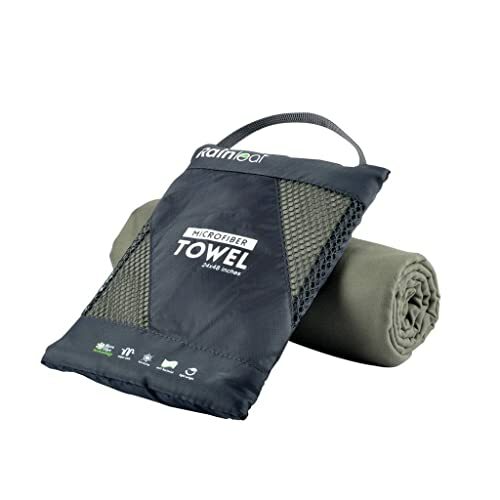 The Alfamo Cooling Towel is another multipurpose towel that is ideal for camping as well as many other tasks. The size of the towel is extra-long with 30-inch length and 12-inch width! Surprising don’t you think? You can easily use it as a mat whenever necessary. 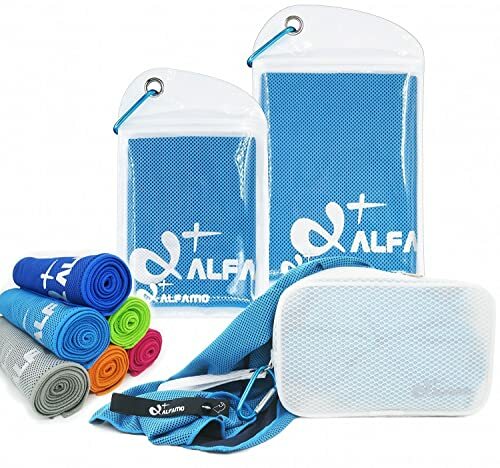 The Alfamo Cooling Towel is made of Hyper-evaporative breathable mesh material that makes it easy to activate the chilling feature. It is silky soft, pliable and easily folds up in a smaller size. It stays chilled for about 4 hours and reduces body temperature like an air conditioner. It also provides UPF 50 sunscreen protection. Also, it dries faster than many other camping towels in the market. The price is not high as well. So, you can give it a try! Fits into a gym bag. Stays chilled for up to 3 hours, and it reduces body temperature up to 30 degrees. The RainLeaf Microfiber Towel is Antibacterial, that’s the best feature a towel can have. It will stay fresh for long and stay away from mildew and germ. They made the towel with skin-friendly microfiber materials. So, it is soft yet long-lasting. The towel is super absorbent as well. You will be able to reuse the towel within a short time. And it dries faster than you could have imagined. The towel is heavily made still it is compact and lightweight. Meaning, you can carry it without any extra hassle. It rolls up smaller, which made it ideal for any outdoor trips. It is easy to carry, space saving, and practice concerning design. 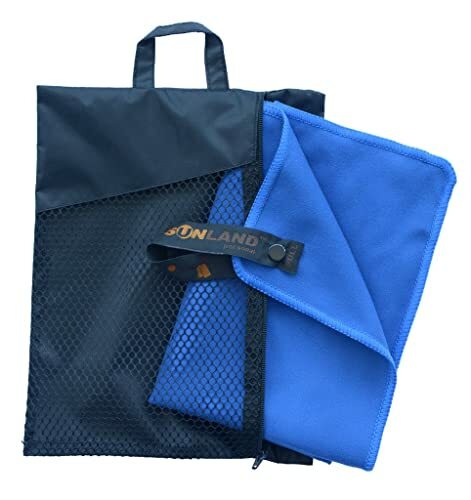 As a travel towel or a sports towel, it is an excellent choice at a great price. So, why are you waiting for? Pick before the stock expires. The Towel is available in XL, L, and Round! Round? Are you kidding me? No, I am not kidding, it’s available in round shape which is ideal to use as a beach blanket. Anyway, it is a sand-free towel made of soft microfiber material. You will feel gentle touch in your skin. However many people love colorful towels. For them, it is a great choice. The towel is available in a wide range of different colors. You can choose according to your need. It keeps away mildews and germs perfectly and is highly absorbent. The towel dries quickly and absorbs moisture as well. It is stylish, and definitely, a must buy for any outdoor trips. But if you are someone who spends times on the beach a few times in a week, this towel is highly recommended for you. 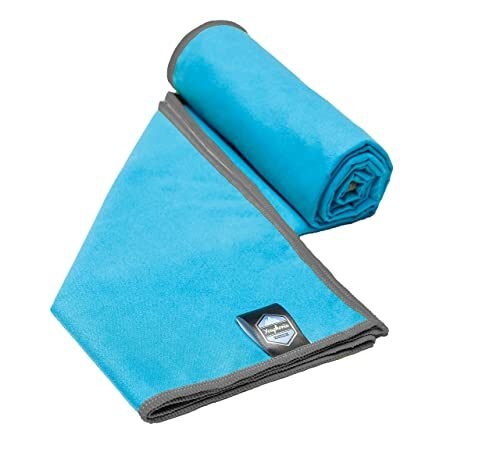 The Youphoria Microfiber Travel Towel is another excellent option for frequent travelers and sports person. It is made of premium quality microfiber material that makes it soft, comfortable, absorbent and durable. It doesn’t keep mildew or odors after use. 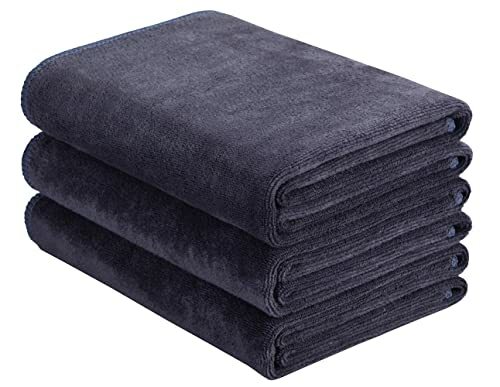 The towel is made of most exceptional microfiber blend that makes it compact and soft. Besides, it dries up quicker than many other travel towels. If you want to dry your skin after swimming, workout, backpacking or anything, this will prove to be handy. Each towel features convenient snap loop so that you can hang it wherever you need. Also, it comes in a carry bag that makes it easy to store and carry. The size of the towel is standard as well. Wondering about the price? Luckily for you, it is still available at a reasonable price. So, pick quickly before the stock turns out. 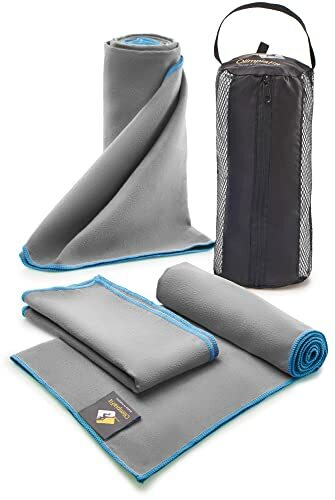 The best part of the HOPESHINE Microfiber Towel is that it is way too much durable than many products in the market right now. It is made of most excellent quality microfiber material. So, you can bet on its longevity. Though the towel is strong, still it is not weighty. The item is thin and soft. The unique terry design of the towel helps it to absorb more water. The absorbent ability will surely please you. The size is also standard. Besides, it rolls down pretty small. Meaning, you can carry the towel anywhere conveniently. Therefore, the towel is machine washable unlike most of the towels on the market. That means you can say goodbye to those cleaning irritation. Though the price seems a bit high for its thin material, still, it is worth for the performance. Wanna stay cool on a hot summer day? Pick the Chill Pal The Original PVA Cooling Towel and enjoy the magic. Just soak it with water, wring it out and wear in your shoulder, that’s it! It will keep you cool on a hot summer day for so long. There is no complicated instruction. However, the construction quality makes it one of the leading in the market, especially during summer! The Chill Pal is made of high grade and extra thick PVA with evaporative technology. That means, the more you water it holds, the longer it takes to evaporate. That’s the secret of the towel. You can stay cool as long as you wish to. The towel is designed to serve a couple of years. It is lightweight and rolls up pretty small. That means, it is ideal for any outdoor adventure, especially for camping. The price is reasonable as well. Why are you waiting for? Pick it before the stock expires! The OlimpiaFit Set of 3 Microfiber Towels is a multipurpose solution for travel, sports, and everyday use. It is made of 100% microfiber. Meaning, it is safe for our skin, soft, and long-lasting. You can use it after a workout, swimming, hiking, camping and so on. The towel dries faster and resistant to odors. If you sweat a lot, this is the best choice you can make. However, an attached elastic band is included in the towel that makes it super convenient when it comes to storing. In a whole, the OlimpiaFit Set of 3 Microfiber towel has everything you want. The price is also standard if you compare with the quality. So, click the link below and pick the towel right away before the stock expires! The KUEN Cooling Towel comes in a pack of 4 towels that serves different purposes. But all the four towels are solidly made so that users can use those years after years without any problem. 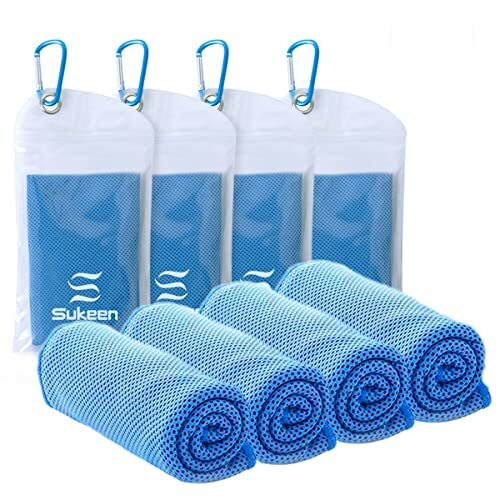 The KUEN Cooling towel is made of Hyper-evaporative breathable mesh materials. So, you can easily activate the chilling towel without any complication. Soak it, wring out and snap it! Magic! The cooling system also uses moisture from towel to keep sweat away from your skin and keep you cool. The towel comes in an anti-bacterial carrying pouch with carabineer clip. The pouch is waterproof as well. So, you can carry the towel anywhere you need with ease. This towel is perfect for sports person and frequent travels. Even you can keep it for regular uses too. And if you want a towel for your lovely pet, this can be your choice. It is made of pets friendly materials. The price is reasonable for the quality. The SUNLAND Microfiber Towel is the last entry today. But don’t consider it as the least option. It is made of high-quality microfiber that will let you feel gentle and soft in your skin. It is non-sticky, and a solid made towel designed for long time use. The towel like all the above towels dries faster. It is a multipurpose towel designed to use everyday indoor or outdoor. The towel can soak up a huge amount of water to make your body dry within a short period. Also, the manufacturer offers carry bag with the package. It rolls up smaller as well. That’s why for outdoor use, this towel is one of an ideal option for you. The price is not prohibitive as well. So, why are you waiting for? That’s all for the best camping towel reviews. You can see all the above products has plenty of cool features and those are suitable for outdoor trips. You are lucky enough to have any one of those. But let me remind you, the stock is limited and those are highly popular products. Anytime, the stock might expires. And that might lead you to a towel that you don’t like at all. So, it is better to have your favorite one as early as possible. We are wrapping up for now. If you have anything to know, feel free to comment us. We will surely get back to you. Stay connected with our blog for many more!